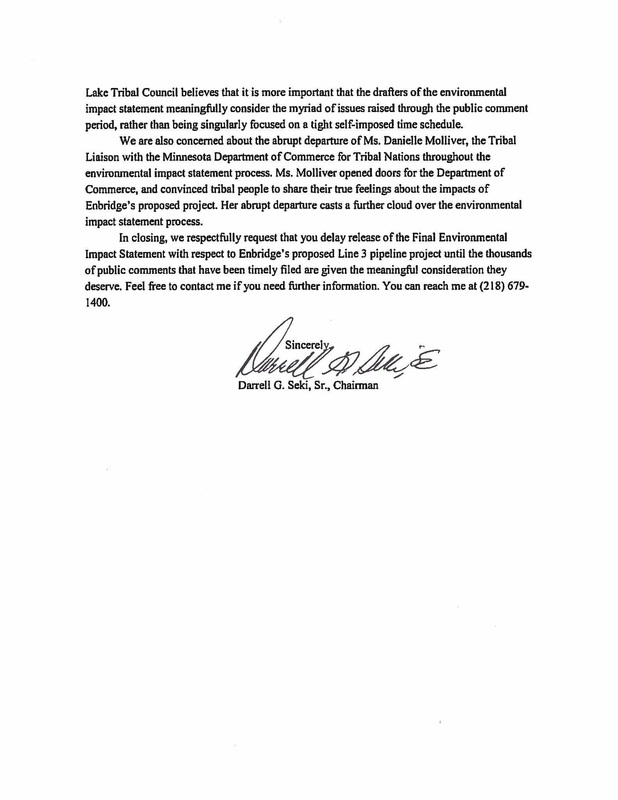 The Red Lake Band of Chippewa Indians (Anishinaabe) has written Governor Dayton to ask him to delay releasing the final environmental impact statement (FEIS) on Enbridge Line 3. It is scheduled to be released today. Line 3 is a proposed tar sands crude oil pipeline from Alberta to Superior, Wisconsin, via Minnesotas. It would travel 337 miles across northern part of our state, crossing the Mississippi River twice and threatening wild rice areas. It would violate treaty rights that allow the Anishinaabe to hunt, fish and gather wild rice on off-reservation lands. 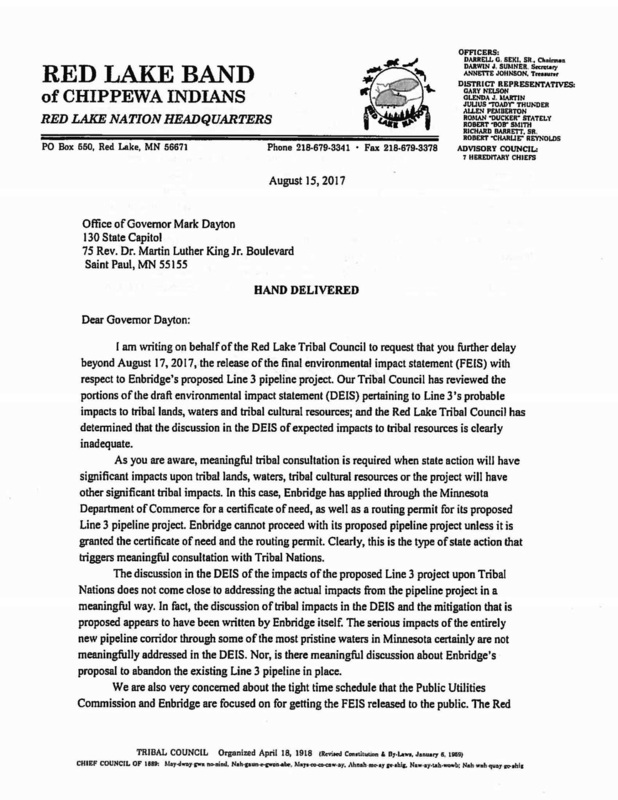 In an Aug. 15 letter to Dayton, the Red Lake Tribal Council said the state’s draft environmental impact statement (DEIS) of Line 3’s impacts to tribal resources “is clearly inadequate.” It also raises concerns about the departure of Danielle Molliver, the state’s tribal liaison for the project, who recently quit over concerns that the state was not showing a good faith effort to work with tribes. We are also very concerned about the tight time schedule that the Public Utilities Commission and Enbridge are focused on for getting the FEIS released to the Public. The Red Lake Tribal Council believes that it is more important that the drafters of the environmental impact statement meaningfully consider the myriad of issues raised through the public comment, rather than being singularly focused on a tight self-imposed time schedule. We are also concerned about the abrupt departure of Ms. Danielle Molliver, the Tribal Liaison with the Minnesota Department of Commerce for Tribal Nations throughout the environmental impact statement process. Ms. Molliver opened doors for the Department of Commerce, and convinced tribal people to share their true feeling about the impacts of Enbridge’s proposed project. Her abrupt departure casts a further cloud over the environmental impact statement process. For more background on why Molliver quit, see our earlier blog.